I had the best of intentions to share this simple salad, one that goes with everything, before Thanksgiving but one thing led to another and maybe this will fall into your weeknight plans. I made the mistake of purchasing a Costco bag of peppermint pretzel thins so the only way to make that right are giant salads. This past weekend we hung lights, wreaths and put out a few poinsettias. I don't own a bunch of holiday decor, but I am eager to make our home feeling cozy and festive this time of year. I have memories of the stuff my mom put out - an old nativity scene with shredded paper hay, stockings with a disney character and our name embroidered on them and the alternating red and white lights that go around the roof. Even though Curran has no idea what's going on yet, I want to build traditions he'll look back on. It's amazing how a mini person can inspire so much intentionality. And I mean that in more ways than just Christmas lights. I'm on this bender of vegetables being chopped small or sliced paper thin. I've mentioned that I finally found a mandoline I'm keen on and it makes the whole situation easier. For Thanksgiving round two with Hugh's family, I shaved multi-color carrots super thin and tossed them with some red quinoa, lentils, micro greens, toasted walnuts and an apple cider vinaigrette. It didn't appear as popular as the mashed potatoes but I will for sure be making that again. I know the crazy starts now - may there be rest and thankfulness in between it. * roast a shallot much like a head of garlic. Trim the end, toss it (skin on) in a little olive oil and pinch of salt, wrap it in foil and pop it in the oven for 45 minutes until softened and caramelized. Time will vary by size of the shallot or how many you do. Simply peek in to check it's texture. Remove to cool to the touch before squishing it out of it's skin. Preheat the oven to 400'. 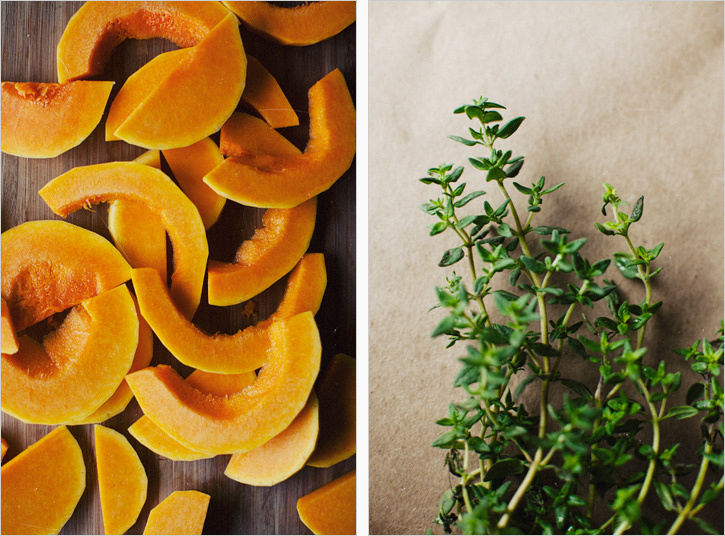 On a large rimmed baking tray, toss the butternut cubes with the olive oil, salt, smoked paprika and cinnamon to coat. Spread in an even layer and bake for 20 minutes until just tender but not mooshy. Set aside to cool completely. In a blender or food processor, whiz all the dressing ingredients together until smooth. Stem the kale and chop it ultra thin. Using a mandoline or excellent knife skills, shave the red cabbage and onion. Collect these items in a large salad bowl. Add the cherries (I chopped mine in half if you feel so inclined), parmesan and pecans, drizzle desired amount of dressing and toss to coat. 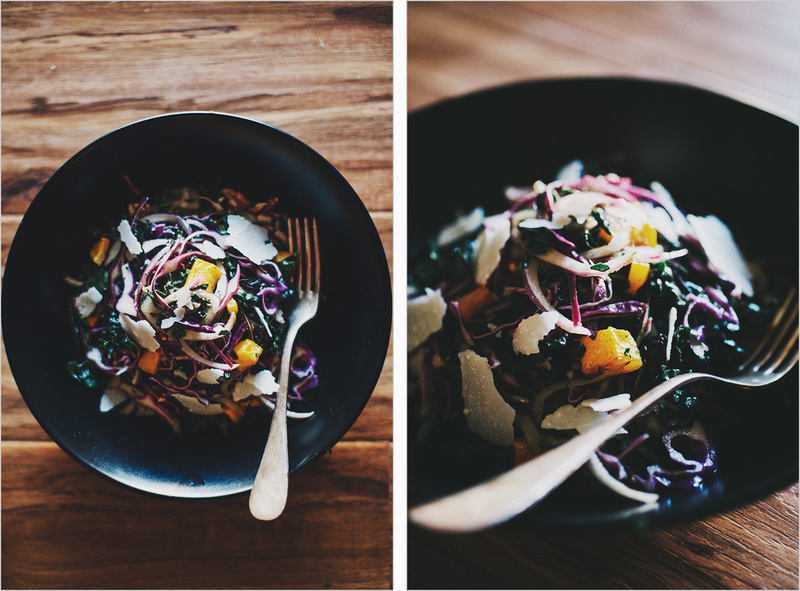 The kale and cabbage can handle, if not improve, by sitting in the dressing for 5-10 minutes before serving. I'm so late to the party of being drawn into the cookbook Plenty by Yotam Otteleghi. I sat in Barnes and Noble with a big stack of cookbooks to flip through and his book was so lovely in its brightness, simplicity and the thoughtfulness of bringing out the best of vegetables. I took a few dozen pictures with my phone of recipes that inspired me, and I plan to buy it after this crazy month is over and I have the time to cook from it. The chapters are divided by vegetable, and while the internet is not short on fall recipes at the moment, I was sure this recipe, as he has written for pumpkin, would be a great way to use some of the butternut squash I have at home. It's a why-haven't-I-done-this-before? 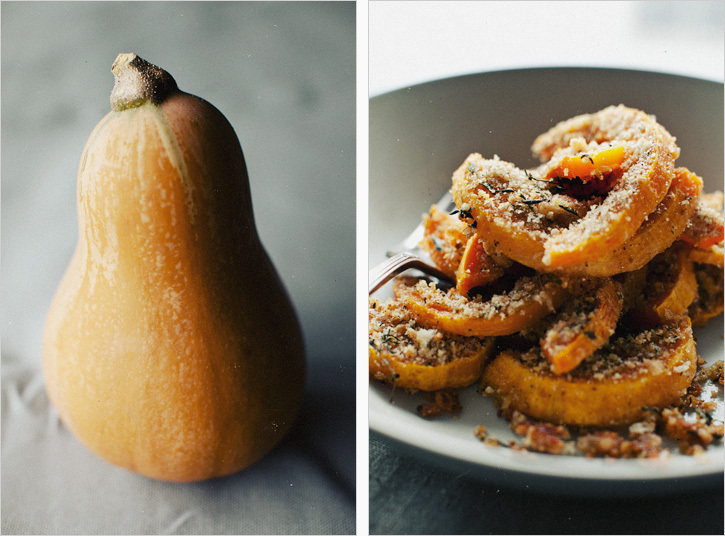 kind of recipe - written with a short list of familiar ingredients, likely things you have on hand and out comes a tender squash with just the right crunch of breadcrumbs and parmesan. I typically make more than we can eat to have leftovers, but this is the kind of side you'd want to have fresh as the breadcrumbs get a bit soggy. I'm giving some measurements, but squash vary so much in size, just use it as a guideline and adjust as needed, each piece needs a nice, hearty coating. We're heading to Hawaii with my family tomorrow for a sunny vacation, and we return to the last few weeks before the manuscript is due for our cookbook (crazyness!). 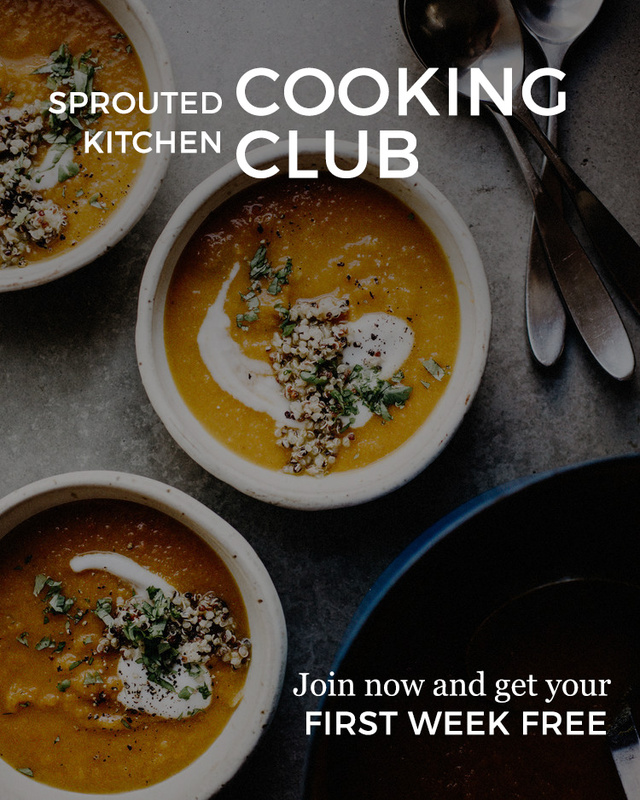 I hope to pop in here for another post amongst all the editing of recipes, photo shoots etc., while both of us are keeping up with other work as well. But if it's quiet around here, it's for good reason. Forgive me. It's a good kind of crazy, I'm excited, feels like I'm in school again, except I'm writing about things I give a hoot about. See you on the other side! I didn't write down the recipe, all I had was an iphone picture and a vague memory, so this is my best shot. I believe the original may have had pine nuts in it, which would have been nice. My one regret is that I gave the breadcrumbs a few too many pulses in the processor and they were too fine, I will leave them coarser next time. Peel the squash (vegetable peeler works great). Slice it in half length wise and discard the seeds. Cut into 1/4'' slices. 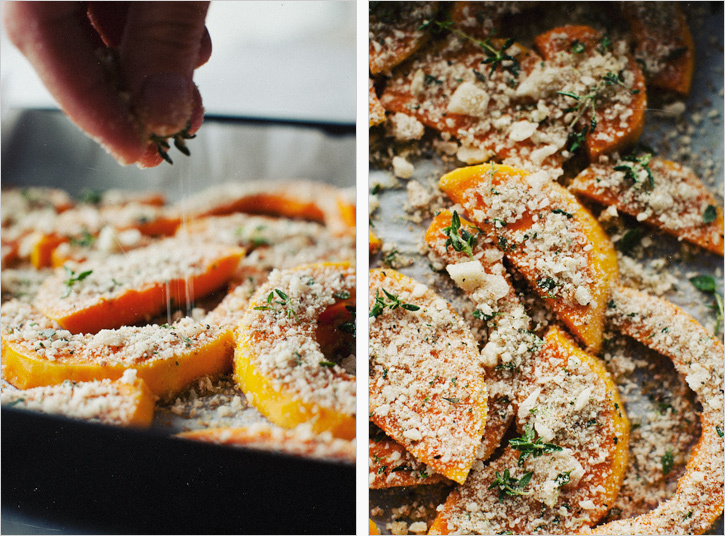 On a parchment lined baking tray, pile the squash, drizzle the olive oil and the nutmeg and toss everything to coat evenly. All should have a thin coat of oil, amount may vary based on size of the squash. Spread them out in a single layer on the baking tray. You may need to use two, too much overlap won't yield a crunchy crust. In a food processor (or magic bullet) pulse together the breadcrumbs, parmesan, garlic, both herbs, a few pinches of salt and a lot of fresh black pepper. Sprinkle the topping on the squash. Bake for about 25-30 minutes until the tops are browned and the squash is cooked.